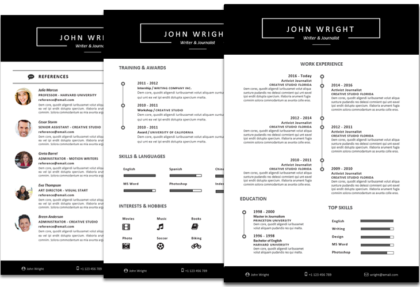 The John Alexander resume template – timeline colored matches the same design and layout of the John Alexander timeline in black and white, while it offers more color variations. 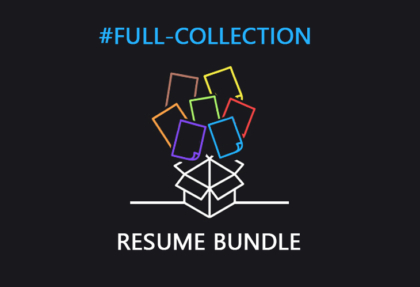 In fact, the black and white version of the resume is included in this package, as well as additional color versions (Blue, Red, Green, Yellow, Pink, Purple, and Fuchsia), so 8 colors in total. 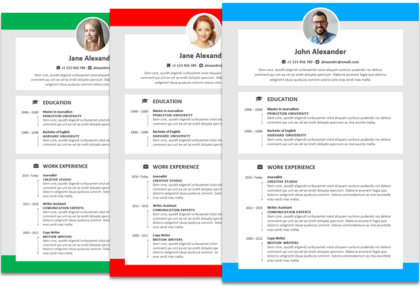 You can also create your own color variation, based on your color preference, as this is a Word resume template model that is very easy to customize. Whether you are looking to apply for a creative job, or you may just prefer to have some colorful resume template to show your creativity, if you are looking for creative resume templates this could be the right choice for you. Additionally, besides the several color options, this is a timeline resume template that differs from the regular layouts. It provides a plus in terms of creativity, while keeping a professional appearance when submitted to the perspective employer, which is very important. You can make your choice between two different packages. Package 1 comes with the first resume page only. It displays the candidate picture (it can be removed if needed), along with the candidate name and contact information. Right below, we can find the “Work Experience” and “Education” sections, styled and structured in form of timeline. The “Top Skills” section, taking advantage of measuring bars, let the candidate list the most important skills that shouldn’t go unnoticed. Package 2 includes the second resume page (“Training & Awards”, “Skills & Languages”, “Interests & Hobbies”), and also a Reference Page and Cover Letter, all matching in style. All sections of this Microsoft Word resume template can be customized to meet any need. 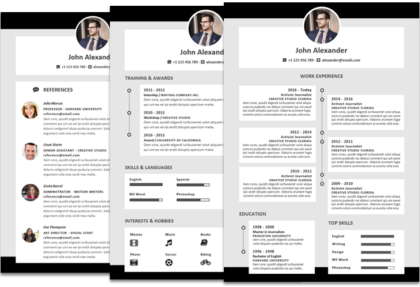 For example, in this second page of the resume, one could use the existing sections to display anything with dates, measuring bars, and icons. All packages come with 675 icons included, that you can use wherever in the template you prefer. 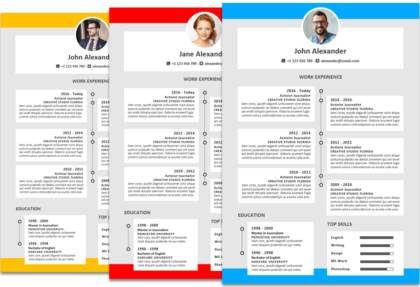 If you are on the look to find a colored and modern resume template, you could consider using this one featuring a timeline layout. 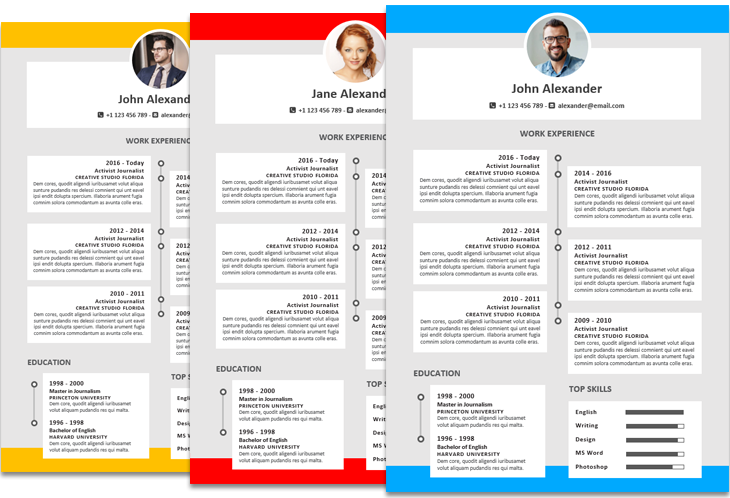 What a beautiful resume template the timeline colored! This resume template is very creative with all the colors it comes with, very nice combination. And there’s a cover letter included. 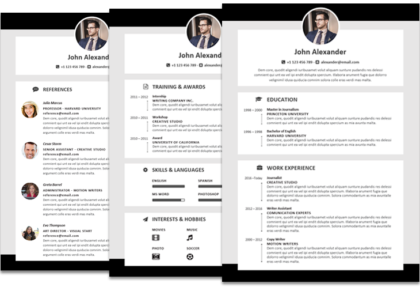 A good example of a modern resume template that can be used for US and UK candidates. CV template with many colors, and many options. A curriculum vitae with so many colors and so easy to edit with Microsoft Word. Cool and unique resume template, I was lucky to find it here, and so colorful and extravagant. I was searching cool cv templates to download, and I was not disappointed to find this one. Finally I found a resume template with photo for word, and in so many color layouts. 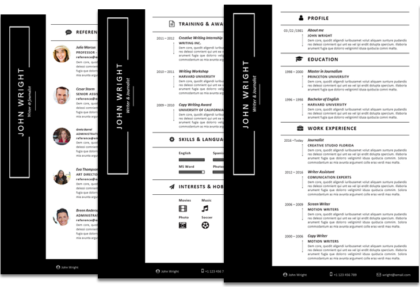 This timeline template for microsoft word is one of the best resume templates, I love this design as it’s so modern. Such a contemporary resume template is this one. 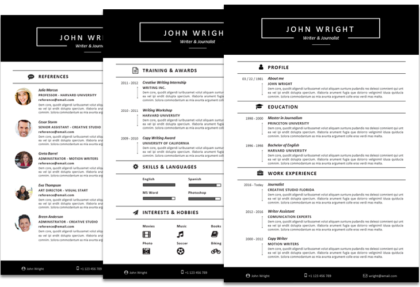 I very like cool professional resume templates and in my opinion this is one of the best ones.